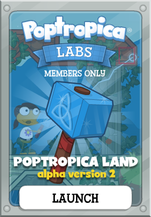 Poptropica Land is no longer accessible and is now called Poptropica Realms. 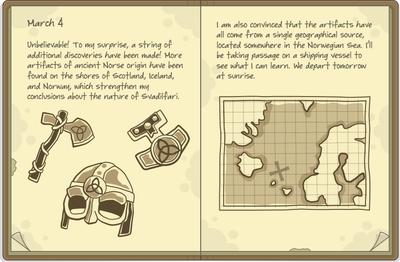 It is still similar to Land, except for the new UI and there is no longer a need to find Svadilfari. First of all, Members, get the new Poptropica Land from the Store; it's free. (If you already got the Prototype version of Land, then it's already in your Store Items). Click Launch on the card to start creating! 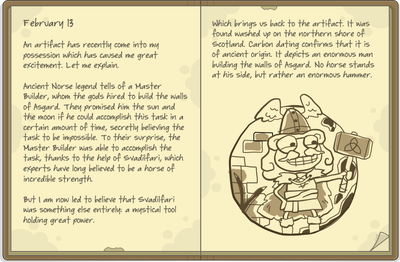 In Poptropica Land, you use a magical hammer named Svadilfari to create and destroy the landscape. Svadilfari, in Norse mythology, is the horse that a builder used to build Asgard, the realm of the gods. A mysterious scientist claims that Svadilfari was in fact a hammer that could be used to instantly shape the land, and you have to find that hammer. And then spend hours doing awesome stuff with it! In case you're interested, the symbol on the hammer is the triple horn of Odin, and the place where you start off in is Asgard. Lands is the successor to Prototype Land. Rather than coins, you can mine Poptanium (looks like blue bubblegum). Every 15 pieces of Poptanium, you level up, getting more building types or biomes, until you collect 150, the highest level. Building and creating is free! 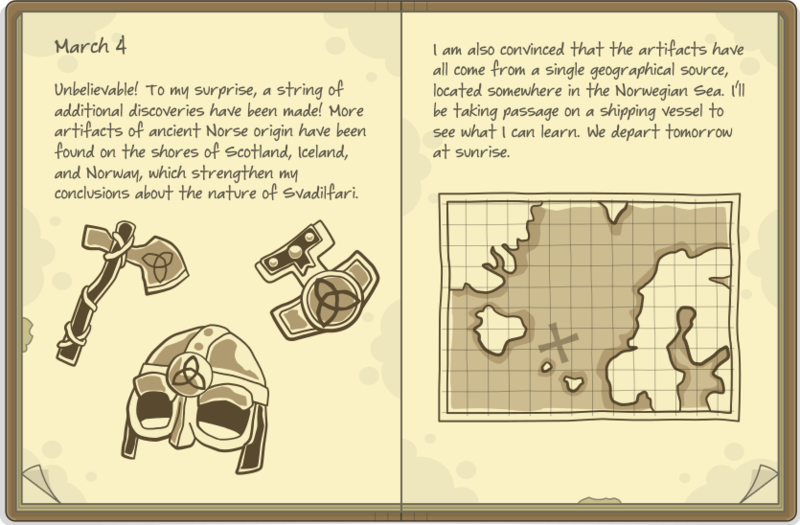 Click here to jump to the tutorial on how to get Svadilfari! Everything you need to know about the Land interface. Press TAB or click on the hammer to see the controls. Press 1 to turn off the hammer, press 2 to destroy, or press 3 to create. 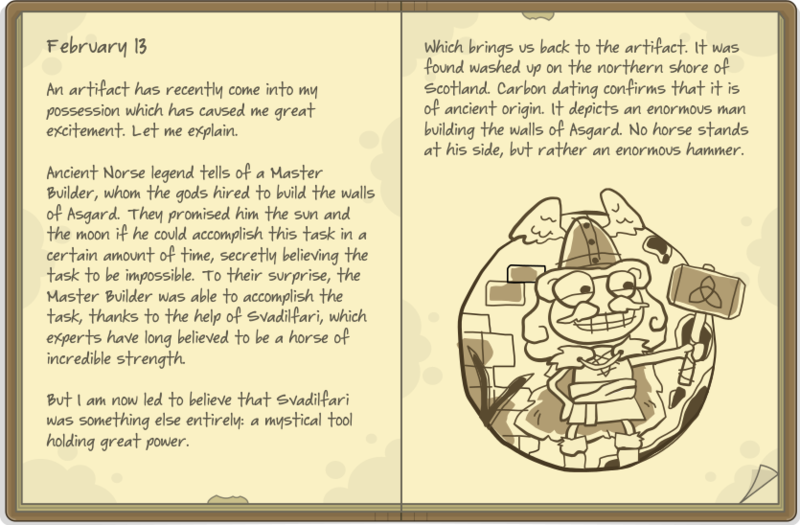 NOTE: The image is for an old version of Poptropica Land. The instructions are still the same, though, and the new version has built-in help anyway. 1. 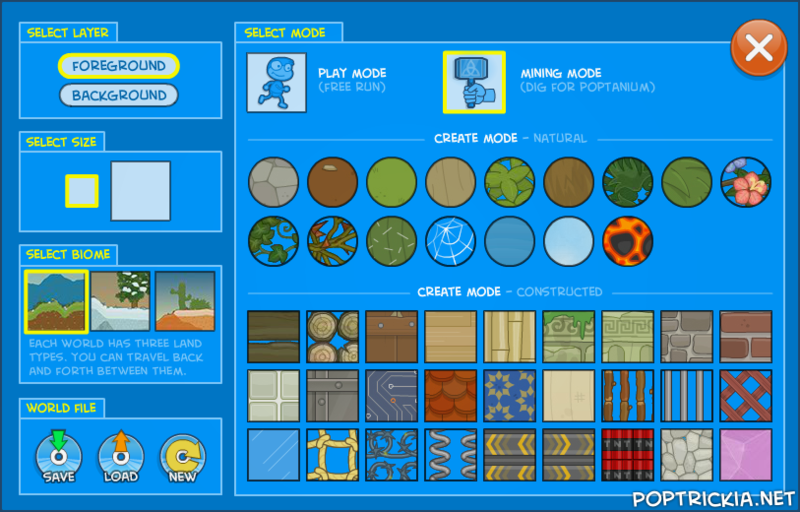 Play Mode: Basically normal Poptropica, no building or creating. 2. 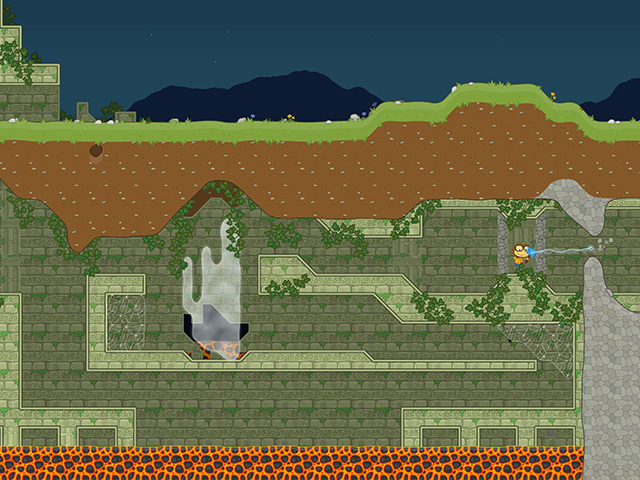 Mining Mode: Click and hold to destroy land, potentially revealing Poptanium. 3. Create Mode - Natural: Create that material wherever you drag. 4. Create Mode - Constricted: Create that material in blocks; adjacent blocks will create diagonals. 5. Create Mode - Props: Choose from a selection of Creator-drawn furniture items and other images. Click the icon of a chair in the top right to flip them vertically. Select Layer: Choose which layer to build/destroy on. The foreground is things you can bump into. Behind that is the background, which looks darker and does not affect you. Select Size: How many blocks will be created if in Create Mode. Remember, Natural mode blocks are twice as big as Constricted mode blocks. 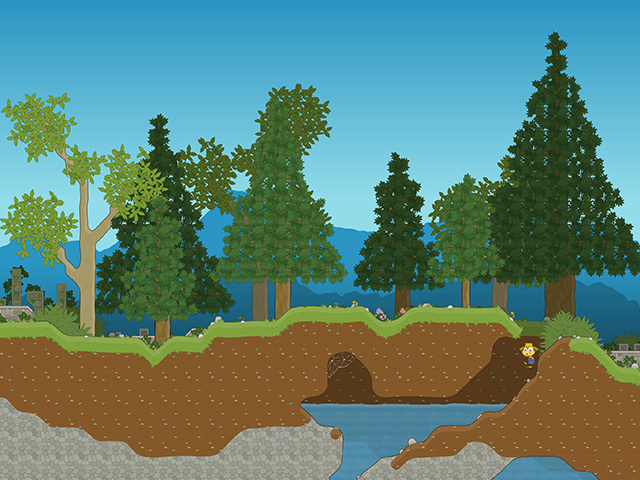 Select Biome: Three completely separate worlds: Asgard (grassland), Snow, and Desert; each one saves separately and you can go back and forth between them without losing your place. Each also has slightly different building types and layers. 1. Save: download a POP file of the worlds you've made. You can send this to others. 2. Load: upload a POP file that will then be used to re-create that world. 3. 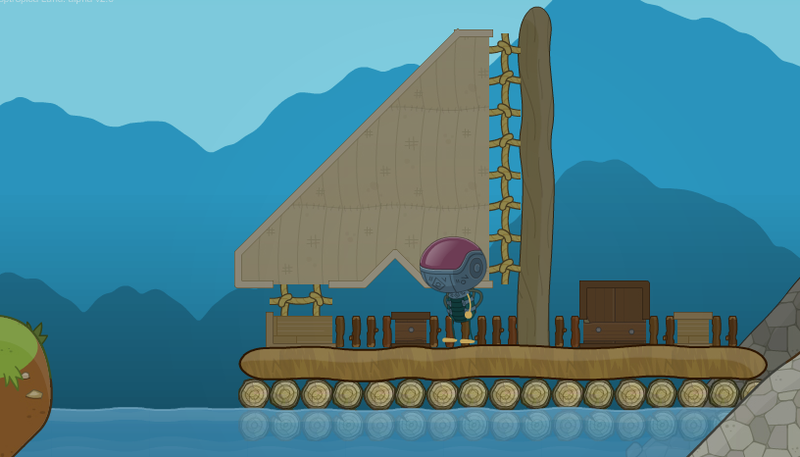 New: reset everything; even the raft and intro level will be gone (unless you saved it). 4. Share: Send your World file to the Creators. They say, "Shared content may be displayed on our blog or in the game." Here's the World file that saves exactly how the world was when you started. The "pure" one has the dialog zones and items removed. NOTE: these are only here for historical purposes since the original world was changed. You'll start off on a ledge next to a raft. 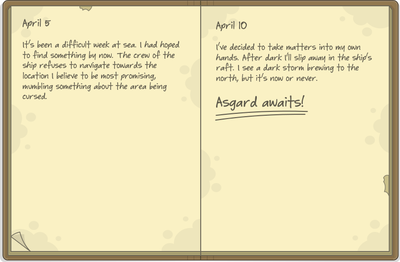 Pick up the journal on the raft; it explains how Asgard in Norse mythology was built with a magical hammer, not a horse. Then go right. Each part of the world is auto-generated when you first walk in, then saved. Each section has water below a certain point, then even below that, lava. Both water and lava cause you to lose health! The deeper you go, the darker it gets. Continue right, jumping over obstacles. Eventually you'll see a series of stone pillars as above. When you reach some pale, crumbly rock, stand on it, and you'll fall down. Drop off to the left, then jump your way right over the lava. Go right. Climb up the "steps" made of stone, then drop down off the right. 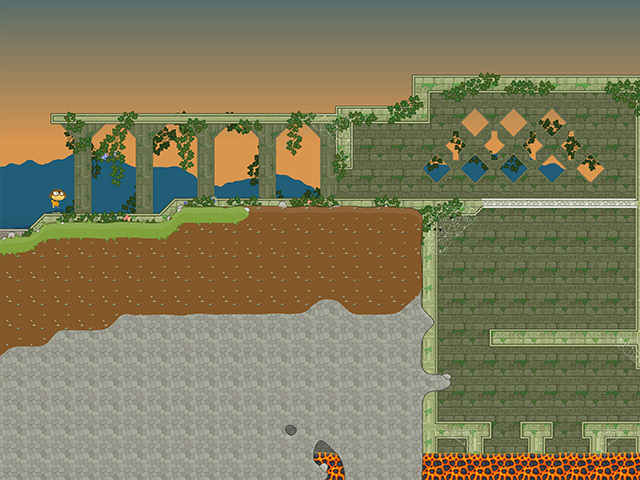 Quickly run across the crumbly platform, then jump up to the platform above. Stand on the ghostly white substance and it'll carry you up. Run right and grab Svadilfari, the hammer!